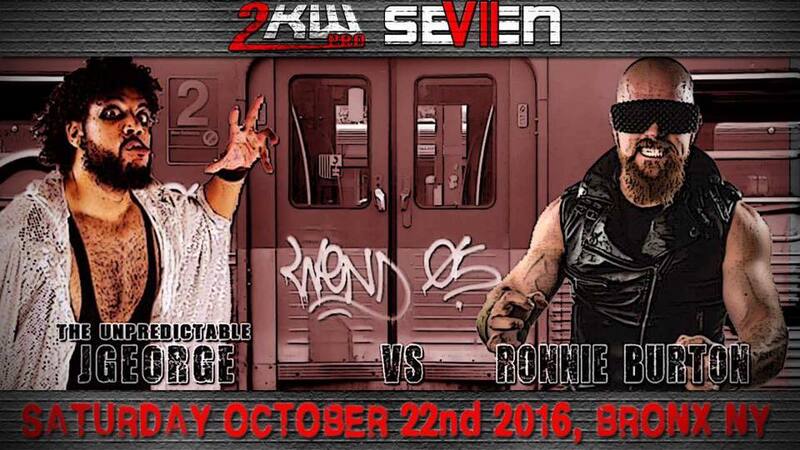 The Bronx was rocked as debuting stars and hometown favorites helped 2kw Pro Wrestling celebrate their seventh show in memorable and epic fashion. 2KW Pro VII was exciting full of fresh faces and electric. The action was fierce and indicative of the promotions growing confidence in their booking and their presentation. A few technical hiccups detracted from the action but nothing that more time and practice can’t fix. 2kw is poised to become a solid and growing promotion and the Bronx and New York City will be better for it. With talent like EYFBO, Sonya Strong, Vale, VSK and Ronnie Burton the future is bright. Fatal Fourway: Caveman vs. Nolan Avila vs. “The Colossal” Mike Law vs. “The Future” Sebastian Cage: The crowd in Daro’s Extreme Fitness was electric as a fatal four way kicked off the night. The match saw fan favorite Caveman take on Nolan Avila, “The Colossal” Mike Law and “The Future” Sebastian Cage. Avilla proved that he felt most comfortable flying high above his competitors as his aerial assault helped keep the match quick and hard hitting. Caveman and Mike Law proved to be the light hearted yet capable heart of the match with funny spots that worked the crowd and kept engagement high. Cage, however, proved to be the strongest competitor. His hard-hitting exchange of elbows and forearm strikes with Mike Law helped round out the action in a very enjoyable match that saw Cage land the springboard elbow for the win. Federated Number One Contenders Rematch: VSK vs. E.A. James: The crowd was then treated to a number one contender’s rematch between VSK with Mr. Martinez of Federated and EA James to crown an undisputed number one contender. VSK and James have great chemistry in the ring. Their moves are crisp and well executed. James has managed to get better since 2kw Pro six with a more fluid and well thought out plan of attack. VSK worked the crowd to gather some cheap heel heat before James managed to get the upper hand. Mr. Martinez injected himself into the match by jumping on the apron distracting the referee. The distraction allowed James to push VSK into Martinez and get a bridging pin on VSK to remain the number one contender for the Federated title. After the match, VSK shoved Martinez showing cracks in their relationship. Sonya Strong vs. Hellen Vale: Hometown favorite Sonya Strong returned to 2kw Pro to face the winner of the very first female match in 2kw Pro History Hellen Vale. The enigmatic Vale was vicious as she took the fight to the Bronx born Strong. The red-haired vixen worked Strong’s knee and hamstring working an old-school heel match and taking away some strength from Strong’s powerful kicks. The leader of the Strong Army prevailed in the end making use of her martial art skills by making Vale the victim of her vicious kicks for the win. Matthew Ryan Shapiro confronts A.J. Orsini: In a brief break from the action Matthew Ryan Shapiro came to the ring in order to call out A.J. Orsini. The two met in the ring to iron out their differences but Shapiro quickly pulled the rug out from Orsini belittling the announcer and making harsh remarks about Orsini’s family. The tension boiled over as Orsini was about to strike Shapiro before the bespectacled Shapiro revealed that he purchased a majority stake in 2kw and would fire Orsini if he struck him. Orisini backed off but for how long can this abuse continue? Will Orsini don his gear again and challenge the now owner? Mante vs. The “All Star” Anthony Silva: Next the crowd witnessed the superhero Mante with Caveman faceoff against the “All Star” Anthony Silva. Silva was the classic heel working Mante with hard, stiff moves that forced the hero away from his traditional move set. Caveman added some moments of levity trying to tag into a singles match to help his masked friend. Mante managed to reverse the beating from the “All Star” to get the pin and the victory. Ronnie Burton vs. J-George: After the hero managed to secure the victory the rafters shook and the crowd popped as Ronnie Burton made his 2kw Pro Debut. The “Rock God” was met with a thunderous ovation as the guitar riffs echoed through the venue. Burton’s fingers worked the fret board as the crowd ate up his entrance His father Steve Burton was in the crowd to watch his son follow his dream a smile adorning his face as he clapped his hands over his head. “When he was small his mom knew not to come in and disturb us while watching wrestling. And now that he’s here following his dream. I can honestly say that I can’t be more proud,’’ Steve Burton said. His son took on the enigmatic J-George who was also making his 2kw debut. J-George took to egging the crowd on as he tried to steal Burton’s thunder. The crowd clearly on Burton’s side was even sporting “Burton Section” signs to confront J-Georges every taunt. Burton worked hard strikes against the faster J-George who had to use speed and unorthodox offense to get any momentum. George even took to doing a dance from the film Beetlejuice in order to throw off Burton’s game plan. However, Burton managed to stay focused and hit J-George with the “Shortest Straw” for the win which caused the crowd to explode in the loudest pop of the night. G.O.A.T. (Raze, Whiplash, and Kris Kage) vs. Team Pazuzu, Angel Ortiz, Mike Draztik and Jaka: The night was far from over as the main event featured The G.O.A.T. consisting of Raze, Whiplash and Kris Kage taking Angel Ortiz and Mike Draztik with Jaka, Team Pazuzu. Pazuzu started strong with Angel Ortiz hitting top rope elbows and leg drops forcing Whiplash to tag in Kris Kage. Kage took the fight to Ortiz cutting the ring off and tagging in Raze for some quick and destructive offense. Ortiz managed to break away and tag in Jaka whose feet made short work of Kage and shifted momentum back into Pazuzu’s favor. However, the monster Raze and Whiplash managed to stem Jaka’s offense with underhanded tactics before getting the pin and defeating Pazuzu. Will the rivalry continue? If this finish has shown us anything is that these two teams are destined for one momentous final clash.